Ghana’s energy provider, Power Distribution Services (PDS) says Sunday’s downpour across the country is to blame for power outages experienced in some parts of the country. It said the rainstorm caused some disruptions in its systems. In a statement on its website, PDS said its engineers were working to rectify the faults and restore power to the affected areas. It also urged those affected by the outage to call their call center to have it address. 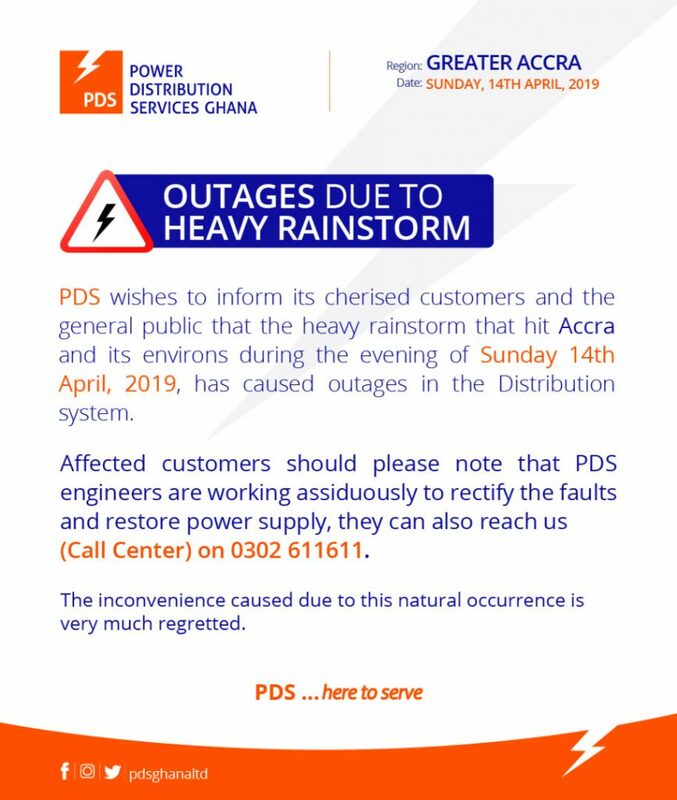 “PDS wishes to inform its cherised customers and the general public that the heavy rainstorm that hit Accra and its environs during the evening of Sunday 14th April, 2019 has caused outages in the Distribution system. Affected customers should please note that PDS engineers are working assiduously to rectify the faults and restore power supply, they can also reach us (Call Center) on 0302 611611,” the statement said. “The inconvenience caused due to this natural occurrence is very much regretted,” PDS added. Last week, the company apologized for a similar situation after a rainstorm. Sunday’s rainstorm which lasted several hours has left at least 5 people dead according to the National Disaster Management Organization (NADMO).